Shrove Tuesday, Pancake Day ,Pancake Races and Tossing the Pancake. These are the nearest Britain seems to have to Fasching and the Pancakes are tossed and eaten on Fasching-Dienstag. 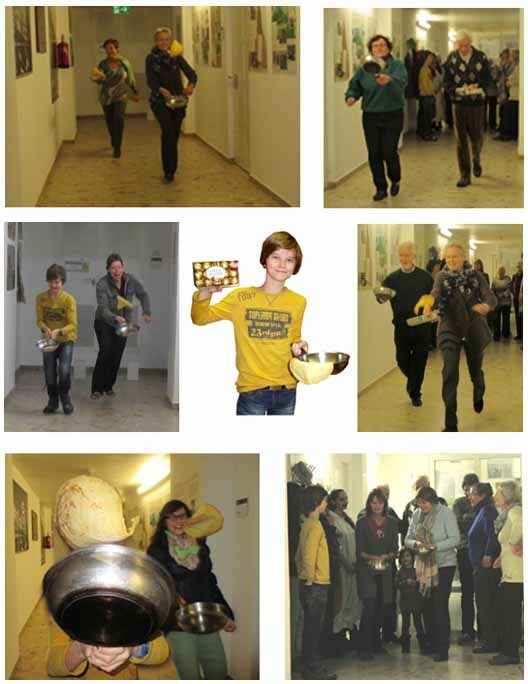 March 4th was the first Pancake Race in the new Austro British Society’s premises and as one can see, a great deal of fun was had by members and guests. Our young guest and winner very kindly shared his prize chocolates with the loosers. Exhausted but happy we all settled down to eat fresh, warm pancakes with homemade, gooseberry jam.